Yo PlayStation.Blog readers! Gamescom is finally upon us, and you know what that means: time for some highly anticipated Playstation All-Stars Battle Royale reveals! 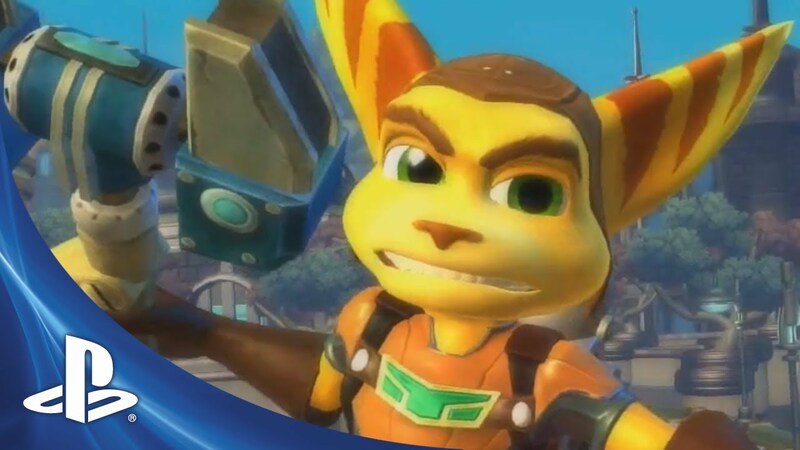 We’re thrilled to announce the inclusion of Insomniac’s Ratchet and Clank in PlayStation All-Stars! Given the wealth of tools and gadgets at their disposal, it made perfect sense to us to include them in our roster. This duo is strongest at mid-range, and they can cut off many points of entry with varied angles of attack. We made sure that iconic Ratchet and Clank weapons such as the Combusto Pistol, the R.Y.N.O., and Tesla Spikes are available for players to utilize on the battlefield. Clank joins in on the fight wielding his powerful Chronoscepter, and even Mr. Zurkon can be summoned to lend a hand! 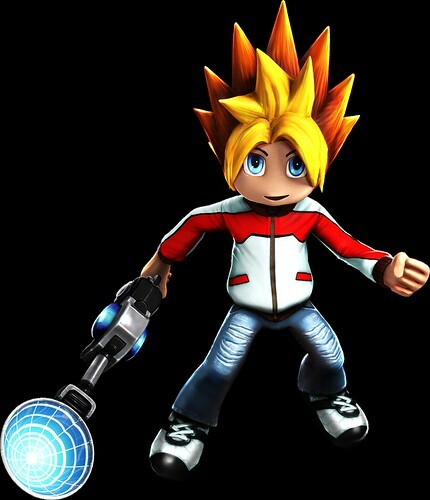 Also joining the cast is Spike from Sony Computer Entertainment’s franchise Ape Escape — a character that was on our radar from early on. We here at the studio have fond memories of the original Ape Escape on the PlayStation, which was revolutionary at the time for introducing unique gameplay elements facilitated by the first Dual Shock controller. The Ape Escape series has cemented itself in PlayStation’s history, and it’s our pleasure to have Spike as part of our roster. He’s a well-rounded character that can compete at close range, or from a distance with traps and projectiles, including the classic R.C. Car. He comes brandishing not only his signature stun clubs, but also peculiar gadgets, crazy weapons, and, of course, apes! Dante from Capcom’s Devil May Cry has also made his way into PlayStation All-Stars Battle Royale! It was imperative that a character with such a rich history and dazzling play style was part of the cast, and Dante fans can finally pit their favorite demon hunter against heavy hitters like Kratos and Heihachi. Dante’s offensive capabilities and mobility allow players to be creative in their assault, ensuring Devil May Cry fans will feel right at home hacking, slashing, and shooting their rivals into oblivion with devastating weaponry and stylish combos. Lastly, we are pleased to announce that Media Molecule’s Sackboy from LittleBigPlanet is joining the rumble! Fans have been clamoring for his inclusion in our roster, and we’re more than happy to oblige. We had a panoply of items and gadgets to draw inspiration from in forming Sackboy’s moves for our game, so we eventually decided we’d give him a quirky and curious moveset that makes him stand out from the rest of the cast. He can produce various objects, gadgets, and tools that have varying effects when in play, affording him a distinct playstyle that is likely to catch foes off guard. Sackboy can pester enemies from a distance with his Cakeinator, and bounce them back to a non-threatening distance with a bounce pad! We are also excited to show you our newest level, Stowaways, taken straight from one of the more frantic sequences in Naughty Dog’s Uncharted 3: Drake’s Deception. Stowaways is a unique stage that forces players to adapt to both long-range and close-quarters combat. The environment is constantly moving and changing, benefiting those who can quickly adapt. As usual, players can expect this Uncharted-themed level to be mashed up with elements from another franchise — which will it be this time? We’re also really excited about the promotional pricing announcement for PlayStation All-Stars that was made at today’s press conference. For all of you that purchase the PlayStation 3 version of PlayStation All-Stars – at retail or digitally through the PlayStation Network – you will be able to download the PS Vita version of PlayStation All-Stars from the PS Network at no additional cost. How awesome is that?!? Now you’ll be able to experience all of the great cross-save and cross-play features that PlayStation All-Stars has to offer on both the PS3 and PS Vita at one great price. So if you haven’t pre-ordered your copy yet, perhaps this news will pique your interest. That’s all for now! 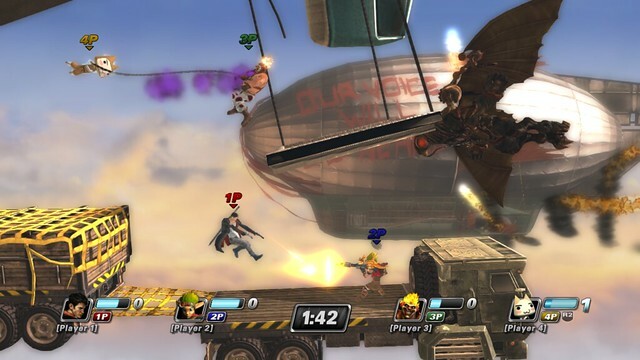 We appreciate the continued support for PlayStation All-Stars Battle Royale from the fans. We still have plenty more surprises in store for everyone between now and our November 20 release date, so keep checking back for more news! OMG!!!! PLEASE LET THIS BE A NORM FOR SONY! Cross play all the way!!!! LOL That’s not the real Dante!! going pre-order now for the ps3, since i’ll get the vita version as well! wasn’t sure which one to pre-order before. wooo! Wait. If I buy Vita version – Will I get Playstation 3 for free (Playstation All-Star Battle Royale)??? A Kirby-esque copy ability for Sackboy? SO MUCH WIN! Or it is only for Playstation 3 that you can get Vita version for free? I was sure Sackboy would make it. Surprised about Spike. Isn’t this Dante not related to the Dante we know? Still waiting to see some females someday; Jennifer from Primal, Ellen from Folklore, and Nariko from Heavenly Sword are all properties they could very well use. how about the hero from Shadow Of The Colossus????anyone???? DAY 1 SUPPORT FROM ME! How does the cross buy stuff work for retail copys of the game? Will it just include a code to redeem for the vita version? and does this confirm a digital release of the ps3 version? don’t remember that previously being announced. Will the original Dante be available in PS All-Stars since that version of Dante is the one with the rich history on PlayStation platforms? I don’t know if you guys have already thought about something like this, but a lot of people who don’t know these characters will be coming in. Have you thought about making a section in the game dedicated to these characters/games? There could be description, and trailer videos. It would be cool if you could put the Parappa the Rapper demo in the game. For newer games, a link to the PSN store like the Fat Princess section has a link to the Fat Princess demo and so on. I think that would really be cool. really new dante you guys are really disapointing me. this and delaying the game come on guys you should get the old school fans excited by showing off i dont know solid snake or pyramid head. but thats cool how i can get both games for the price of one, going to preorder today. Now this game is actually starting to look interesting. Please confirm this is not all the characters, that there is still more to come?! More to come of course. We’re not done yet! Awesome. You guys killed it this Gamescom imo. Lot of good stuff. Only thing though, I hope Dante comes with the gray haired bad a** as an alt costume. Not to into Dante’s new looks. Pretty excited for the game though. Just pure awesome all I can say just AWESOME!!! I am loving the growing list of characters. One suggestion: I know the 3rd party characters are great, but there are PLENTY of great 1st party characters still worth attention. Hoping to see a few glaring misses announced before release. As far as I know, I am the only one saying this, but when will it be confirmed that Polygon Man is the final boss? The ORIGINAL mascot! It has to happen! Thank you so much Sony. I knew you guys would so something special for cross play and put a bundle out but I didn’t expect the Buy 1 Get 1. Thank you a lot. Also, thank you SuperBot for giving us the cooler Dante and not the lame one who always feels the need to give his LIIIIGHT! out. Ok so we know all the leaked stuff is real. Now where are the people we can be suprised by? Cloud Crash Spyro Snake Ico Wander etc. Any idea when we will get more reveals or is this it until release? Sheer awesomeness across the board! Really enjoying the beta so far and I cannot wait for the full release! SuperBot, you guys RULE!!!! For those who are wondering, no this isn’t a comprehensive list of the characters in the game and they confirmed the leak from a while back. Nariko is in the game, and Spike was on that list. None of these characters or stages was a surprise but it is so cool to see them in person. Dante looks sick. They kept his combo ability intact. I was never a big DMC fan but he looks like a ton of fun to play. Since PSASBR will be available on PSN, will we have the chance to pre-order the PS3 version and get the pre-order bonuses on PSN?? If not I may end up buying at retail, but I would rather buy this game digitally. Looks awesome. I would have to say the cross-over level is Bioshock Infinite judging by the blimp in the background. Wait does Sackboy have a teleport? And did he transform into Parrapa? 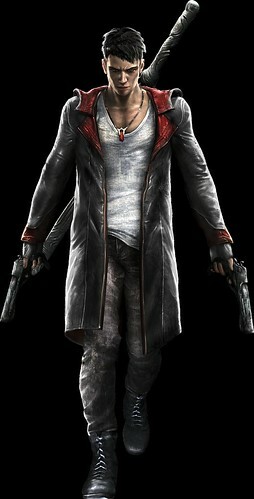 Man I hate emo Dante but man does his and Spike’s combo look swagtastic. They look fun to play. Cross-buy, thank you Sony. Now just let me access my cloud saves on my Vita via wi-fi or 3g and I’ll personally mail you the money to cover the cost for the free Vita version. the new uncharted stage is mixed with bioshock inf. right? Awesome news! 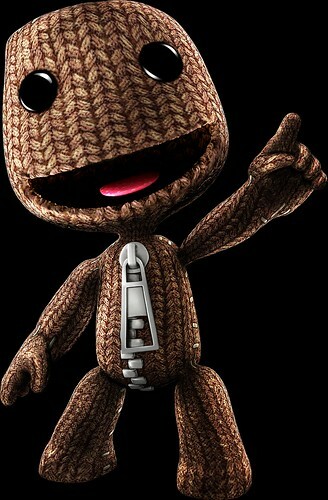 Sackboy looks super interesting to play. Cant wait for some more character announcements! Keep up the great work SuperBot!!! Ratchet is already WAY over powered. I understand the Dante here is to promote the new DMC game coming out, but I hope he will have a skin for the original Dante. Thank you Sony and Superbot for CrossBuy!! We understand that different people have their own favorite version of Dante. However, once players sit down and try him out they will realize that he’s simply a blast to play! Will the real Dante from the first 4 games be in this? Or is it just the Dante from the new/reboot game? Real Dante would make this game a Day 1 buy for me, but so far none of the other characters have made me want it more than casually. Still looks like a great game, I just don’t know half the characters. Oh Yeah, Ratchet & Clank in This.. But Still waiting for Crash Bandicoot and Ty The Tasmanian Tiger, Spyro, also Assassian’s Creed. Are There going to be a boss in this, Likes Super Smash Bros.
Is that Songbird I see in that Uncharted stage? Loving the beta btw. If Sony don’t choose Gabe Logan for this game, I’ll hate Sony for a long, longe time! It’ll be a shame seeing how Sony used the character for 8 years, and other characters like Parappa and Fat Princess are not that used and are in the game! Gabe Logan passed in every Sony console out there…PS1, PS2 and PSP. He deserves to be in the game as much as Kratos, Sly Cooper and Sweet Tooth. Think about it Sony! Think about it! Syphon Filter and Gabe Logan went on through PS1, PS2 and PSP, that are systems Sony doesn’t support anymore. I’m a really big fan of the franchise and of the caracther itself, and i’ll be pissed if Sony doesn’t include him. I guess Playstation All Stars Battle Royale is a tribute to characters that really defined a generation, a system. Gabe Logan made much sucess in the PS1 era, much more than Parappa. He continued in the PS2 and PSP, from 1999 to 2007, throught 6 great games. Fat Princess has only 2 games out there and she is in the game. Why Gabe Logan with 6 games (still) aren’t? I really like Kratos, Sly Cooper, Cole Macgrath, Nathan Drake and Jak & Daxter, but I’ll say it’s sad for the part of Sony to exclude Gabe Logan like this, like he never existed. Original Dante should be a costume. Other than that, this an AMAZING game so far! Superbot, you know what you’re doing with this game! Can’t wait for more. 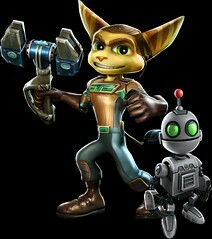 also, no armor for ratchet? still no prinny, eh? so we got a big daddy, and dante from a game which i dont even think comes out until 2013 but we dont got prinny, a character that has been on ps2,ps3,psp, AND the vita. I’m not thrilled that emo-dante is in it, but I’m excited to hear confirmation about the other characters. I love the Uncharted 3 stage, that looks incredible!